Mirabella Cafe, in the Barclay’s Shopping Center on Rt. 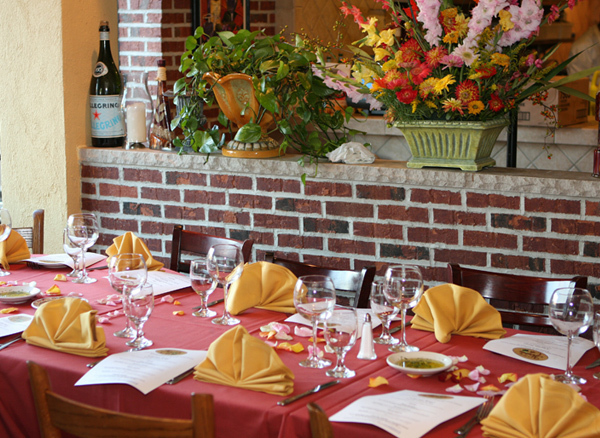 70 in Cherry Hill was the scene of a last-minute, pre-movie dinner on Saturday evening. The evening did not start well as I had neglected to remove my flash card from my computer where I was downloading photos taken earlier in the day at the USA – Turkey soccer match at the Linc in Philly. Consequently, for the first time since I started this blog, I would have no pictures from our meal. Fortunately, Mirabella’s web site had a few photos that I can use. As you can see from this photo. outside seating is available. We opted to eat inside as we were a bit pressed for time. The menu at Mirabella Cafe is fairly extensive and they have a few specials which are shown to you, plated as they would appear, on arrival. There was the usual bread and olive oil for starters. Joe and Carol were not in a wine mood so Kathy and I shared a 2008 Marquis-Phillips “Sarah’s Blend”, Australia. We have both had this wine through several vintages and tonight’s was drinking well with crisp blackberry flavors mingled with peppery notes and some licorice tones. This is, in my estimation, one of those wines that you can always count on. It might also be noted that the wine glasses at Mirabella are great; large Bordeaux-style stems. Kathy, Carol and Joe split the Grilled Fiorella’s Sausage and Broccoli Rabe. I tried a little and thought it was just OK. They liked it more than I did. I had the bruschetta. It wasn’t that impressive. I’m not a fan of the very crisp croutons that the toppings fall right off as you attempt to bite through it. As the meal progressed, it became apparent that our server, Mark, might have a career in politics when his table waiting days are over as he was a true expert at promising things on which he had trouble delivering. Joe is still waiting for his coke that never arrived and each request brought an enthusiastic “Excellent, I will make that happen immediately.” Too many times we had to remind him of what we had requested. I thought it might be that he had a preponderance of tables but Joe said he just seemed to head to the nearby computer after each brief stop at our table. Salads preceded our entrees. Fresh greens with feta and pecorino cheese with a lemon flavored olive oil dressing were tasty enough to the others but I found it a bit bland. I chose Chef Joe’s Spaghetti and Meatballs, a nice portion of pasta with two large meatballs. I found the sauce fine, the meal hot and the meatballs delicious. I would prefer my spaghetti slightly less al dente but that’s just me. The portion was large enough that I took home enough to provide another meal. Kathy ordered the Whole Wheat Pasta Primavera which came topped with fresh seasonal veggies. She ate what she could and also brought home enough to make another decent sized meal. Carol had the Eggplant Rollatini and thought it was good. Again, the serving provided enough for another meal. Joe was the only one who finished his entire meal and that may have been because he selected the Pesto Crusted Tilapia, broiled and served with warm lentil salad and sauteed escarole in a light lemon citronette. 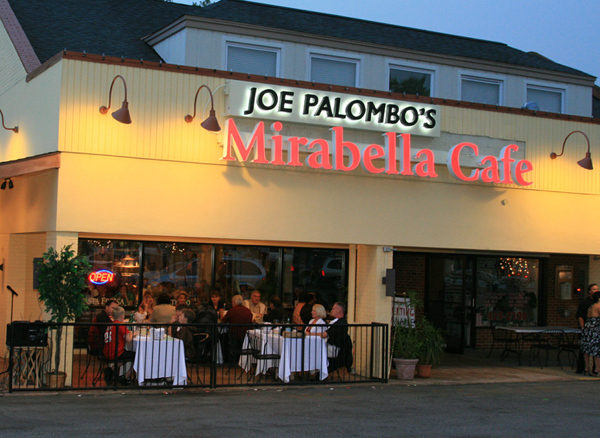 Joe Palombo’s Mirabella Cafe serves good food at reasonable prices in a bright, cheerful location. The service on this particular night was less than stellar but the meal was fine.